If you’re not feeling super optimistic about the upcoming Vancouver Canucks season, you can be forgiven. After all, this team is coming off a second straight lack luster playoff appearance, dismissed their most successful coach, traded away their supposed franchise goalie, seemingly alienated their current franchise goalie and did nothing of note during NHL free agency. So yeah, you can be forgiven if you’re not planning Vancouver’s Stanley Cup Championship parade route just quite yet. The Canucks may have some cards stacked against them. Along with the previously mentioned items they also are moving into a much tougher division, one that will not be a cake walk the way it was in the Northwest. Despite all that, it may not be all doom and gloom for the Canucks this year. As summer is winding down and training camp is on the horizon, here are some reasons to feel good about the Canucks. There are a lot of NHL teams that would be happy to be ‘stuck’ with a goalie as good as Roberto Luongo. While the drama surrounding Luongo never seems to fade away the fact is, he’s still a top shelf goal tender. He’s coming off a season that saw him relegated to only 20 games so he should be well rested coming into this year. In those games he put up a pretty decent .907 save percentage and goals against of 2.56. On top of that, this year he goes into the season with nobody breathing down his neck. 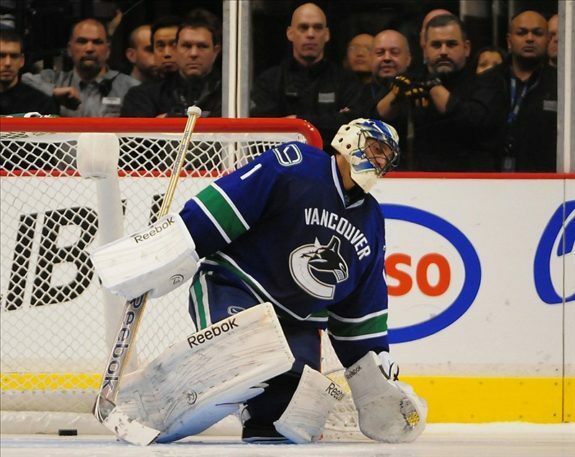 With Cory Schneider in New Jersey there is no doubt that the Canucks crease belongs to Luongo. Something that has not been certain for over two years now. Nobody is going to be clamoring for Eddie Lack or Joe Cannata to be starting over Luongo. With all the off season drama of ‘is he gone or not’ Luongo seems to have made peace with the club – going as far to show up early to work out with some of his teammates. With head coach John Tortorella’s penchant for gritty, defensive hockey Luongo could be in for a stellar season in 2013-2014. There has been a lot of talk about the decline of Daniel and Henrik Sedin. While they are not at the level they were in 2011 or 2012 they are still top line players who can score. Despite their so-called decline in skill and advancing age they were just short of being point per game players last year – a year that saw Vancouver have trouble keeping a steady set of forwards. For the past several years they have flourished playing with Alex Burrows and it will be interesting to see if Tortorella keeps that line together or starts to experiment with guys like Zack Kassian. Regardless of who plays on their wing its safe to assume that the twins will both put about between 75-80 points in the ledger this season and give Vancouver one of the better top lines in the Pacific Division. With the teams in the division being amongst the stingiest on defense, having a top line that can score consistently will be a boost. Ryan Kesler can’t get hurt again, can he? For what seems like the last twenty seasons, Ryan Kesler battled through injuries last year. He only appeared in 17 games and never really seemed to find his stride. The good news is that he hasn’t had surgery this summer and should be ready to go from the start of the season. This has to be the year he can stay healthy right? When he’s healthy and on his game there are few players in the league who go as hard as Kesler. He can shut down the opponents top lines, is a monster on the power play and brings energy to the team on the ice. When he’s hurt, or playing through an injury, he seemingly vanishes. Kesler seems ready to go, he has stated that he is excited to play under Tortorella and if Vancouver can get him for the full season they will have an anchor to their second line. One of the things that plagued Vancouver last year was some inconsistent play on their blue line. While they still were one of the better clubs in the NHL from a goals allowed standpoint it seemed that too often they had defensive breakdowns. They also never seemed to find pairings that they could stick with nor find the right way to utilize Jason Garrison. That should change with Tortorella. Expect Garrison to get regular time on the power play this year, where he can unleash his big slap shot. The Canucks also bring back their defensive corps in its entirety. There were times it looked like Alex Edler may get moved and that they might loose Chris Tanev to free agency (or the KHL). Both are important players and with them remaining on the roster the Canucks bring back a pretty deep group. With a full training camp this year the club should see more consistency on the back end and will continue to be tough to score against. It seems like forever and a lifetime since the Vancouver Canucks had contributions from young players. For the past seven years they’ve relied on the same core of guys, while adding a dash of veterans along the way. That is going to change this year. Vancouver’s big question marks are the lack of depth down the middle and where they are going to find secondary scoring from. Can young guys like Kassian step up? Is this the year Jordan Schroeder sticks in the NHL? Can Bo Hovart or Hunter Shinkaruk make the jump this year? One of those players is going to be asked to log a lot of ice time for Vancouver this year and if nothing else, it’s exciting to finally see some new blood with the Canucks. Might we see some of this at Rogers Arena this season? The Canucks aren’t used to having to fight it out for a division title. They owned the now defunct Northwest Division and benefited by being able to pencil in home ice advantage in the first round of the playoffs. While it won’t come that easy this year, the Pacific is a winnable division. You could argue that Anaheim, San Jose and Los Angeles are ahead of Vancouver – but they aren’t ahead by much. There is no team in this division that can say they are the clear favorites. If the Canucks can find that secondary scoring, can keep Kesler healthy and Luongo stays sharp, they could easily find themselves on top of the heap again. So instead of feeling down about the Canucks prospects this year, buck up. It isn’t all bad. There is hope that they can squeeze some more magic out of a roster that has treated their fans pretty well over the past seven seasons. While nothing is guaranteed in the NHL one thing seems certain – the Canucks will be in the mix again. That alone should be reason to be optimistic. Things could always be worse, they could be the Buffalo Sabres. The NHL regular season schedule was released on Friday. Check out our partners at TiqIQ for the best deals on Vancouver Canucks tickets for all 2013-14 games.